Episode 4 of RICHES Podcast Documentaries: Gentrification and Urban Renewal. RICHES Podcast Documentaries are short form narrative documentaries that explore Central Florida history and are locally produced. These podcasts can involve the participation or cooperation of local area partners. Episode 4 examines some of the factors that led to the ultimate decline of what was once a relatively prosperous African-American community in Central Florida, the efforts that have gone into restoring them, and the effectiveness of those campaigns. Primarily looking at the history of the Parramore district and Hannibal Square, discussion topics range from the effects of urban development and gentrification to the ways in which these communities have fought to preserve their heritage and improve their neighborhoods. This podcast examines some of the factors that led to the ultimate decline of what was once a relatively prosperous African-American community in Central Florida, the efforts that have gone into restoring them, and the effectiveness of those campaigns. Primarily looking at the history of the Parramore district and Hannibal Square, discussion topics range from the effects of urban development and gentrification to the ways in which these communities have fought to preserve their heritage and improve their neighborhoods. Original 27-minute and 59-second podcast by Geoffrey Cravero, April 1, 2011: "RICHES Podcast Documentaries, Episode 4: Gentrification and Urban Renewal: Revitalizing Central Florida’s African American Communities." RICHES Podcast Documentaries, Orlando, Florida. Cox, Dale. Old Parramore: The History of a Florida Ghost Town. S.l: Createspace], 2010. Dickinson, Joy Wallace "Parramore Legacy: 'Black History is Part of Everybody's History'." The Orlando Sentinel, July 2, 2006. http://articles.orlandosentinel.com/2006-07-02/news/ORFLASH02_1_brotemarkle-oral-history-central-florida. "RICHES Podcast Documentaries, Episode 4: Gentrification and Urban Renewal." RICHES of Central Florida. http://deimos.apple.com/WebObjects/Core.woa/Browse/ucf.edu.2577623765.02577623773.7292816977?i=1331393182. Frazier, Amanda E. On the Other Side of the Tracks: Redevelopment in West Winter Park. Thesis (A.B. Honoris)--Rollins College, 2001, 2001. Florida. Urban Revitalization in Florida. 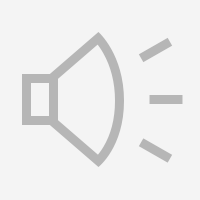 [Tallahassee, Fla.]: Florida Legislative Committee on Intergovernmental Relations, 2005. "History of Pathways for Parramore." City of Orlando. http://www.cityoforlando.net/economic/pathways-for-parramore/. Livingston, Fairolyn. A Window on Hannibal Square: A View of Life in Early Westside Winter Park and a Portrait of the Lives and Careers of Walter B. Simpson and Frank R. Israel, the Only Black Men to Every Hold Office in the City of Winter Park, Florida. 1997. Russin, Teresa. The Community Land Trust Model and Smart Growth Principles As a Means to Provide Affordable Housing in the Face of Gentrification. [Gainesville, Fla.]: University of Florida, 2007. http://purl.fcla.edu/fcla/etd/UFE0021792. "Welcome." Hannibal Square Heritage Center. http://www.hannibalsquareheritagecenter.org/aboutus.html. "Welcome to the Hannibal Square Association." Hannibal Square Association. http://www.hannibalsquare.com/. I’m Dr. Connie [L.] Lester, the Director of the RICHES program, and you are listening to the RICHES documentary podcast. Welcome to the RICHES documentary podcast. RICHES—the Regional Initiative for Collecting the Histories, Experiences, and Stories of Central Florida—is an umbrella program housing interdisciplinary public history projects that bring together different departments at the University of Central Florida with profit and nonprofit sectors of the community in order to promote the collection and preservation of the region’s history. By facilitating research that records and presents the stories of communities, businesses, and institutions in Central Florida, RICHES seeks to provide the region with a deeper sense of its heritage. This series feature a podcast every two weeks, in the middle and at the end of each month that will explore various aspects of Central Florida history. In today’s episode, “Gentrification and Urban Renewal: Revitalizing Central Florida’s African-American Communities,” Geoffrey Cravero examines some of the reasons that these once flourishing neighborhoods began to decline, and what city leaders are doing to save these communities. Hi. I’m Geoffrey Cravero, and in today’s episode, “Gentrification and Urban Renewal: Revitalizing Central Florida’s African-American Communities,” we’re gonna be speaking with Representative Geraldine [F.] Thompson and Dr. Benjamin [D.] Brotemarkle about the Parramore district of Downtown Orlando, and Dr. Julian C. Chambliss and Fairolyn Livingston about Hannibal Square, the African-American side of Winter Park, Florida. Central Florida’s African-American community was once relatively prosperous, consisting of a thriving business district, populated by a mix of professionals and working-class families, and in many ways, quite self-sufficient. This podcast will examine some of the factors that led to the ultimate decline of these regions, the efforts that have gone into restoring them, and the overall effectiveness of those campaigns. Geraldine Thompson has been a representative in the Florida State Legislature since 2006. A former educator and administrator at Valencia Community College, she is also a founder of the Wells’ Built Museum of African American History and Culture. The Executive Director of the Florida Historical Society, Dr. Brotemarkle has written several books on Florida history and culture, including Crossing Division Street: An Oral History of the African American Community in Orlando and Beyond the Theme Parks: Exploring Central Florida. You might also recognize him as the producer and host of Florida Frontiers, the weekly radio magazine of the Florida Historical Society. Dr. Julian Chambliss is an associate professor of history at Rollins College, specializing in 19th and 20th century urban America, African-American history in Florida, race and ethnicity, American planning history, as well, as other topics related to the urban experience. Born in Hannibal Square, Fairolyn Livingston has spent most of her life in the community, and is now Manager of the Hannibal Square Heritage Center. I’d like to thank each of our guests for taking the time to speak with us. I asked Representative Thompson and Dr. Brotemarkle to tell us about the rise and fall of Orlando’s Parramore community. Parramore was founded in the 1800s, uh, when the city was just, uh, beginning to form, and it was the location where many African Americans lived initially. The city was separated, as was the case throughout the South, generally by the railroad tracks. You had the, uh, white community on one side and the African-American community on the other side. So, uh, Parramore is just west of the railroad tracks in Downtown Orlando, and the pioneers in the African-American community who made significant contributions to the City [of Orlando] and to Central Florida lived in Parramore. When the community went through integration at the end of, uh, “legally sanctioned apartheid” —is what I call it—uh, the idea was that, in order to get true integration, you had to close some of the major institutions in Parramore. So you saw the schools, uh, close. Many of the churches also moved out. Uh, the Parramore area had become saturated, and people needed other places to live, and so, uh, places like Washington Shores, the Richmond Heights area, uh, Carver Shores, were established and many people moved to those areas which were, at that time, considered the suburbs, and many of the professionals who lived in Parramore also moved, and so you left behind, uh, people who were, for the most part, renters, who did not own the properties where they lived. Uh, there was very little that was owner-occupied in Parramore—a lot of absentee landlords. So when you lost the major institutions like your schools, your churches, the professional individuals who had made it the economic and the social hub for African Americans in Central Florida, then an element, uh, of crime began to—to build, and, uh, there were a lot of problems, and quite frankly, a lot of the decision-makers, who were deciding what was going to happen and how Central Florida, uh, would grow, did not really consider Parramore worthy of much of an investment, and so that’s what led to a blighted area for a very long time. There have been a lot of very effective efforts to bring business back into the community. Uh, there is one charter school now in the community—the Nap Ford [Community] School. Other than Nap Ford, however, there are still no schools in Parramore. The students are bussed out to nine different, uh—different schools in—in the area. Uh, the businesses that have come into the area include, uh, the Bank of America. You now have the Federal Courthouse that is also built in the Parramore area, as well, as the Florida A[gricultural] & M[echnical] University College of Law. Uh, the Wells’ Built Museum, which is in the former Wells’ Built Hotel, um, is celebrating now 10 years—our 10th anniversary, and so we have been able to document, and to preserve, and to share a lot of the history of Parramore, which makes people much more aware that it is a significant co—uh, community, and as we revitalize and as we grow, it’s something worth saving. We are in the process of, uh, restoring the residence of the person who built the Wells’ Built. His name was William Monroe Wells, one of the early African-American physicians here. He came here in 1917, and in addition to a thriving medical practice, he had a social club, which was called the South Street Casino, and he brought, uh, big bands, [Edward] “Duke” [Kennedy] Ellington, [William] “Count” [James] Basie, Ella [Jane] Fitzgerald, to perform at the South Street Casino, which he owned, and after the entertainers, uh, finished performances, they didn’t have a place to stay. So that was his motivation for building a hotel, and, uh, so in addition to refurbishing the Wells’ Built and operating it as a museum of African-American history, we’re now in the process of refurbishing his home, which was located where the new Amway Center, uh, is, And that’s another business that has come into Parramore, which is Downtown Orlando, and so the home was moved rather than, uh, to have it demolished, and we will make it part of the museum complex, and we’ll operate a museum store in Dr. Wells’ residence. So his legacy is alive and well, on South Street. Well, there are many factors that—that led to the demise of the hotel and casino. Uh, first of all, eh, as—as great and wonderful and necessary as the civil rights laws of the 1960s were, once African Americans could move anywhere they wanted to, uh—and this is not unique to the Parramore neighborhood. This happened to communities throughout the South, in particular, uh, but many of the community leaders—that[sic] helped keep the infrastructure of the community together—moved out of the neighborhood. So consequently, in many cases, uh, all that were—were left were the people who couldn’t afford to move anywhere else, and actually, in the case of the Parramore neighborhood, this had actually started a little bit before that in the 1950s. People had started migrating over to the Washington Shores neighborhood in Orlando, but the—the—the civil rights laws definitely contributed to the continued exodus, uh, from the Parramore neighborhood of many of the people, uh—the community leaders. Uh, also, the building of I[nterstate Highway]-4, uh, right through—right by the—the Parramore neighborhood kind of—into that neighborhood, uh, helped to break that up a little bit, as well. Uh, that was, uh, another factor. Uh, so as these—as the community leaders moved out of the neighborhood, the Parramore neighborhood itself entered, uh, a state of social and economic decline, and, uh, I—I think it is starting to, uh, pull out of it a little bit, and that was really part of the purpose of the Wells’ Built Museum of African American History and Culture—was to be an economic engine for the neighborhood, and hopefully, tap into this cultural and heritage tourism and bring people into the neighborhood for that reason. It is a fascinating era because, uh, again, between—with—with Division Street as the dividing line the—the Parramore neighborhood was really a thriving, self-sustained community, uh, parallel to the—to the white community in Orlando. Uh, here were institutions, Jones High School, uh, many of the churches, uh, that really created a strong fabric. Uh, uh, there was a, uh, uh, African-American chamber of commerce there in the Parramore neighborhood. There were black theatres. There were everything that the community needed right there. Uh, tailors, and—and businesses of all types were right there, and—and of course, the Wells’ Built Hotel and South Street Casino right in the middle of all this—this—this thriving African-American community. So it’s really an interesting, uh, look at history, and—and also, the unintended negative impact of those civil rights laws in the 1960s, again, as—as wonderful and as necessary as they were, they really did have this—this unintended negative impact when, uh, some of the community leaders moved out, and, again, the building of I-4, kinda right through the heart of the community, and, uh, the East-West Expressway too, meeting right there, uh, caused further problems, uh, but I—I think that the community is—is pulling out of that era of social and economic decline that it suffered in the late 20th century, and hopefully the Wells’ Built Museum of African American History and Culture is contributing to that. Dr. Chambliss and Mrs. Livingston describe some of the factors that enabled Hannibal Square and Winter Park to grow into thriving communities, and how this prosperity has affected the development and gentrification of the region. Well, in that early period, um, Hannibal Square, was, I think, able to grow and be successful because, of the model of, uh, attracting residents, promoting, uh, Winter Park as a sort of like leisure, uh, vacation destination, uh, and this has really become at the core of the identity of Winter Park. If you think about Winter Park over time, it really was founded by [Loring] Chase and [Oliver E.] Chapman as a sort of destination location for people who wanted to sort of live a certain kind of sort of leisurely lifestyle. Well, into, uh, 20th century that—that has been maintained. If you look at the growth of Winter Park, uh, which grew rapidly after, uh—in the 1930s and 1940s and 1950s, like, and the people of Winter Park recognize. It’s part of the reason that it grew is because, like, they really sort of like saw the place as a kind of residential haven, and the fact—by the time you get to the 1950s, um, the city is known as the “City of Homes.” Um, and part of this is because they have like a large number of wealthy residents. Again, those wealthy residents have servants, and some of those servants are working in—in—are black people, uh, working in these white homes and then going back across the railroad tracks to Hannibal Square. So like, they have this steady work from all these rich people and that really does affect Hannibal Square. At the same time, there’s a number of architectural—James Gamble Rogers is a very well-known architect—really sort of crystallized the architectural identity of Winter Park, with a fresh revival—a Medi—a Mediterranean revival style. So when you look at the homes, there’s a lot of like talk about Winter Park and Park Avenue—really sort of like crystallizes that sort of European style, uh, café culture look, right? And that really starts in 1960, and they really sort of keep trying to promote that. The chamber of commerce does a great job of trying to promote that and maintains it really today. it’s one of the reasons that these places really talk about Winter Park. They tend to talk about it as a place where you just want to kind of like stroll, in sharp contrast to the rest of the sort of retail and vacation experience in the rest of Central Florida, and as a consequence, the growth of the east side of Winter Park has been phenomenal, and the value of land there has grown tremendously, and so much so that by the time you get to the late 1990s, uh, arguably, the east side of Winter Park is built out, alright? So you can’t cheaply acquire land on the east side of Winter Park. You can buy a lot and—and really, we’re talking—we’re talking about the high-end of the real estate bubble, and Winter Park was one of the places where values were extremely high, and so the east side, really, by—by every stretch of the imagination is really sort of built up in value, um, over the period of the town. The west side, which was the black side—which was sort of like off limits because it was—because of segregation—had lagged behind. It started out with the development of the town, as I—as I said, a sort of economic area where African-American property owners, and—and business owners, and African-American businesses were flourishing in Hannibal Square, but very quickly, with the end of—of official Jim Crow segregation, um, you see middle-class people moving out, and the median income and the median age on the west side of Winter Park really starts to—the income starts to go down. The age starts to go up, and services for the west side don’t keep. in fact, [inaudible] great stories about the fact that the roads, on the west side of Winter Park, weren’t really sort of kept up at the same level as the roads on the east side of Winter Park, And other kinds of infrastructure issues like that, and as a consequence, the value of homes and property on the west side lagged behind that was on the east side of Winter Park. So value of black property lagged behind value of white property, which is common. As a result of that, there’s a lot of push, um, to do something about the—the view—the view-scape and the housing stock on the west side, and if you go back and look at some of the language that people use in the city council meetings or in some of the things that people are saying when they—they’re pointing to houses that are boarded up, they’re talking about a spike in crime, and indeed, there is a real concern that Hannibal Square, which by this time, is no longer home of like businesses more like light retail and bars and things like that—convenience stores—that are really the haven for—in the minds of white residents, at least—crime and violence. Indeed, there is[sic] the police reports show large number of drug arrests or suspicious crime in the west side in 1980s and early 1990s, and it really sort of spurs on dialogue about what needs to be done to improve the housing stock to clean up Hannibal Square and basically correct this problem, and there are a variety of reasons for this. I mean, some of it was the crime, but also, if you look at the way that the town is laid out, if you’re coming in through[?] the main drag, coming in—off of, like, Orlando Avenue, one of the main sort of like entry points into the city of Winter Park is through, um, Morris [Avenue], and you basically go through the heart of the black community to do that, and if you go back to the 1990s, that looked radically different than it does now. If you look at it now it looks actually quite nice, ‘cause it’s been rezoned and it—there’s new buildings, uh—office buildings, mix-use stuff—but back then, it—there were homes there, and some of them were boarded up, and the City had routinely had issues or had programs in place where they were trying to address this question, of, like, the quality of housing stock on the west side. They had some housing rehabilitation programs that they created in the 1970s. They supported, of course, you know, the creation of the Winter Park Community Center in Hannibal Square, but really, you know, the economy changed, as I said, and the median age started to creep up. So you get a large number of elderly people who, eh, own property—been in their family for generations—but they couldn’t keep it up in a way that the City might want, and so—so this created an opportunity for developers to come into, um, the west side and champion sort of a new push to sort of rehabilitate the region, and this made sense from the City’s standpoint, because, like, depressed property is low—low tax property. so if you want to increase your tax base, you want to improve the—the value of the property there—but it also created, like, a high gentri—gentrifying push, because, remember, you can’t cheaply build anything on the east side of town. So for most developers, they’re really looking to do a big project. they kind of have to do it on the west side of town. They had to do it west of the railroad tracks. So in the late 1990s and the ear—early 2000s, the City of Winter Park creates a Community Redevelopment Agency—the CRA—and the sort of focal point of the CRA is the sort of box that is bordered by Park Avenue on the east, Webster Avenue on the north, and, like, [U.S. Route] 17-92, and then Fairbanks [Avenue]. So it’s a huge block, and basically it’s Park Avenue and Downtown Winter Park, and the black side of town. So that’s a huge swath of land, and it—it’s prime real estate that could be developed, but is also, primarily, the heart of the black community, and almost immediately, large numbers of residents in the black community recognized that the City’s efforts to improve the area of the CRA was going to push out the black community. Now, from the City’s standpoint, the City’s always maintained that its goal was to maintain the character of the black community or the character of Hannibal Square, but if you’re going to allow traditional market forces to be your primary vehicle to achieve this, then gentrifying effects are almost unavoidable. You can’t, as the city’s done—like the city’s done a, uh, sort of three-tier sort of approach. It’s provided loans for businesses to move into Hannibal Square. It totally redesigned, um, Shady Park, which is in the center of Hannibal Square, in response to some of the crime and complaints of some of the businesses that were being enticed into the—into the area, because of the CRA. So the old part was—had a lot of benches and—and shading covers, and—and older people would hang out there and talk, and the new park sort of took all that away, and is much more aesthetically pleasing, but is also a place where you can’t really linger, which made a lot of sense, in terms of trying to address some of these questions about crime and—and—and disruption associated with that area—um, but they also worked very diligently to eliminate some of the bars, some of the focal points of crime, and that was successful. They moved in new businesses so that Dexter’s on Winter Park, uh—Dexter’s a fairly well-known restaurant chain in the area—where it became like really an anchor and they created a parking lot for it, and then a number of other businesses—light retail, service-oriented, and restaurant businesses—moved in, and of course there was a train—a change in the infrastructure or the sort of decorative infrastructure of the street. So like you had the decorative brick put in, and, like, new lightening-like fixtures—so basically, extending the feel and look of Park Avenue, down New England [Avenue] into, uh, the heart of the community, which was Hannibal Square. Of course, African Americans felt and, I think, some of them continue to feel that that process is deliberately pushing them out, and they have a point, because once all that—all that was in place, one of the things that started happening is that the—the tax assessment for the area started to change. People had previously—been sort of locked at a tax assessment of like, you know, a very low number. Everything gets reassessed when a large number of businesses start moving in. So these are older people. Remember, the demographics of the area are that the older people are staying and younger people are moving out. So the old people tend to be on fixed incomes, and pensions, living off their retirement savings. So a big hit, in terms of—“I used to pay $500 in taxes. Now, I’m paying a thousand.” It’s a huge deal, and because the property on the west side, as I said, had not kept up with property on the east side, there was a new assessment on all the value of the property. So people were being offered you know, two, three, four times what they bought the property for originally—and to move out—and some of them were, and this is one of the things that really sort of like characterized the region. So, um, at the height of the real estate bubble, there was tremendous gentrifying pressure on Hannibal Square, and lots of developers were active in the area, and probably the most famous ones was Dan Bellows, who’s usually associated with the transformation of Hannibal Square. he has a number of big projects, and, you know, sort of mixed-use with retail on the bottom and residential on the top, and that really sort of, like, changed the nature of the community, and Bellows is often painted as a boogeyman, and there are a number of stories associated with him, but he’s sort of emblematic of a kind of push to create new construction in the area, in part because that’s the place where you can with relatively minimal investment do something big, and that has been the sort of overriding problem for the west side for many years. There has been, for well over a decade—I mean, since the late 1990s, I think, there’s been a sort of push to—“There’s going to be the in here. I want to improve the west side. I want to bring more businesses here,” and as a result, uh, longtime residents have, um, sort of been displaced. There are new businesses there, but they don’t really cater to the residents, or nor do they really employ the residents, which is also really problematic. I mean, you don’t really see west side residents going to eat at Dexter’s. So from a sort of symbolic standpoint, African Americans feel that they’re being pushed down, and from an economic standpoint, there are push and pull factors that are hastening the exit of African Americans in the area. Leading up to, uh, the Civil Rights Movement and even probably as early as 19—late 1940s, after the, uh—World War II, the job market begin[sic] to change a bit. More opportunities will open up for, uh—for Afro-Americans. Many Afro –Americans, uh, went away—military, school, whatever the case may be—and didn’t come back, because they felt there was nothing here for them, outside of service to somebody else. They wanted to have real careers and—and—and do big things in the world, and as a result of that, the community began to age, if you will, and certainly after the Civil Rights Movement and—and moving forward, many more of our young people are moving away, because they feel that they don’t have access or they can’t make it in this area in—in—in Winter Park, you know? It’s been a painful process for them. Generally, uh, when you’re talking gentrification, between the original people who were in a place, and the wealthier people who come into the place, there’s usually a group—a group in between, but for us, we went—we went—we went right from, um, families being displaced to a business area that really doesn’t have any services that local people find of service to themselves. So gentrification’s been a hurtful process, because when people come in to redevelop, they don’t come in to redevelop for the people who are there. They don’t get input from the people in the community, because that’s not what’s gonna drive the dollar, you know? Nobody’s gonna come in and put in affordable housing or affordable rental units outside of a group such as Habitat for Humanity, who’s doing a great job, and the Hannibal Square Community Land Trust. Uh, people felt that they were just pushed aside, and the most painful thing was the picture that was painted of the neighborhood. That’s what they did. They just [inaudible] and made it like a noose, and put it around the necks of the people in this neighborhood, and pulled the chair. See, some people have been injured over and over and over again. They were injured during slavery. Then, after Reconstruction, they were injured again, and then, Jim Crow came along, and they were injured. So they’ve been injured over and over, and when you keep injuring people, and they[?] don’t get a chance to heal, it—it can really do something to—to them. You know, even though on the outside, they look cold, and they’re moving forward, and they’re doing things, there’s still a pain in their souls that is just almost undescribable[sic]. I’d like to thank our guests, Representative Thompson, Dr. Brotemarkle, Dr. Chambliss, and Mrs. Livingston for joining our discussion. I’m Geoffrey Cravero. Thank you for listening. Cravero, Geoffrey. 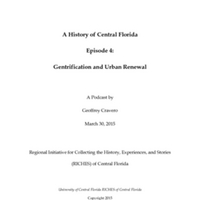 “RICHES Podcast Documentaries, Episode 4: Gentrification and Urban Renewal: Revitalizing Central Florida’s African American Communities.” RICHES of Central Florida accessed April 18, 2019, https://richesmi.cah.ucf.edu/omeka/items/show/2456.